These are images of the stained glass windows in the First Christian Church, Eugene, OR. Some of them probably date to 1897, and were brought from an earlier church building to the current building when it was constructed in 1911. The others were created especially for the 1911 building. There is no documentation to establish what studio created the earlier windows. The 1911 windows were definitely made by Povey Bros., the first, and most important stained glass studio in Oregon. Povey Bros. operated a studio in Portland during the heyday of American art glass, from the 1880s to the 1920s. The windows they made for First Christian Church are mostly scenes from the life of Christ or depictions of him. This window is apparently an illustration of the story of Lazarus being raised from the dead. The quote at the bottom of the window is from that passage in the Bible. 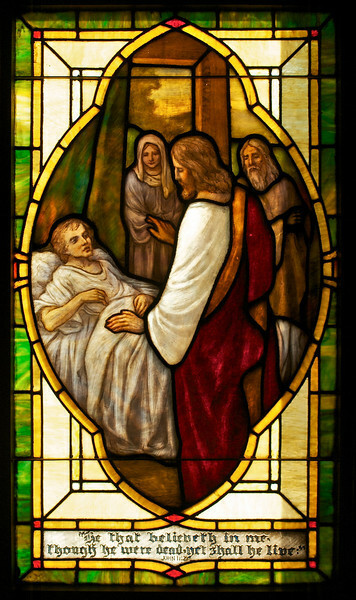 However, the picture itself looks more like the story of Jesus healing the young daughter of a prominent man.